Yes, I know this is a bit late. Everybody and their brother has been talking about Tuesday and Obama’s win. 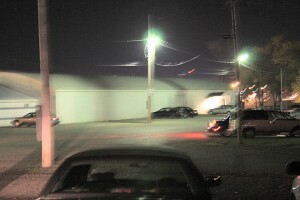 I had given some thought to driving over to Chicago and standing outside the fence at Obama’s party. But I figured that they wouldn’t call the election until late, and I would have a 4 or 5 hour drive home afterward. So I decided to call the local Obama campaign back and offer to work on the GOTV effort Tuesday, then get a pizza and watch MSNBC and CNN after the polls closed. Then I got a call on Monday afternoon that changed my plans. I voted in September, the first day it was available. I am pretty sure I was the first person in the county to vote, since they were still sorting out the ballots they had just received from the printer when I went in. While I was there, I offered to work at the polls on election day if they needed me. They signed me up for the training class and put me on the list of people to call if needed. They were pretty happy to have me, since there are not that many people registered as Democrats in this part of the country. I knew they had me on their list, but they did not call, so I figured I was free to do what I wanted on the 4th. Then the Board of Elections called me at about 4:30 in the afternoon on November 3rd. Could I work the polls the next day, they had 3 people call in sick. I said yes so the next morning, I had to be at the Junior Fair Building at the County Fairground at 5:45 AM. 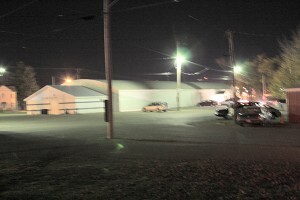 5:45 AM, heading in to work the polls on November 4, 2008. Why would anyone think I was tired, just because I couldn’t hold the camera steady. The really bad part about needing to be there so early is the fact that my normal schedule has me going to sleep about 4 or 5 AM. I managed to get about 3 1/2 hours sleep before getting up and heading to the polling place. But I have a harder time handling lack of sleep than I did when I was younger. Imagine that. The ladies I was working with were surprised to see me, apparently no one had told them the woman they normally worked with was not going to be there. But they quickly put me in her normal place, and showed me what to do. 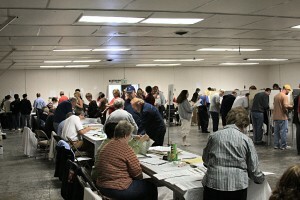 People marking their ballots or waiting to do so at 10 AM. Things progress fairly smoothly during the day. There were quite a few people waiting in line when the polls opened at 6:30 AM, and they quickly found their precinct table and got their ballots. Then there was a wait, since there were not enough booths for everyone at once. 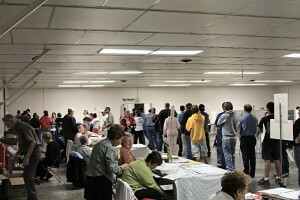 It was not a long wait for most people, despite the size of the ballot. I got the impression that quite a few people were either just marking the races for offices and local issues or they had researched the Ohio constitutional issues before they came in to vote. I would prefer the second, since I rather like the idea of an informed electorate. More people coming in, at about 4:30 PM. The stream of voters was pretty steady all day long, at least for the precinct I was working in. 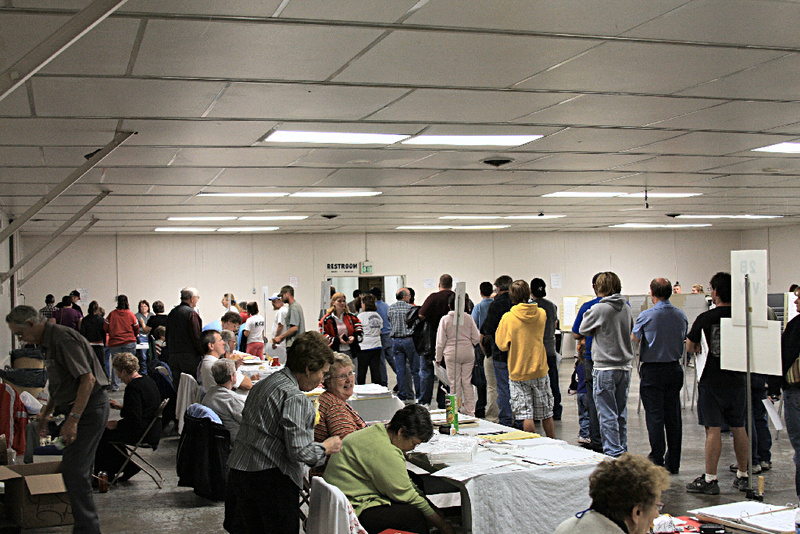 We never had more than 4 people going through the process or waiting in line, but we seldom had more than 15 or 20 minutes without someone wanting to vote. We didn’t mind this, since it really helped to keep us busy and made time fly by. With a 15 hour day working the polls, anything that made things seem faster was welcome. Even if it meant they interrupted us while we were eating at the table. Waiting to drop ballots in voting machine, 6:15 PM. 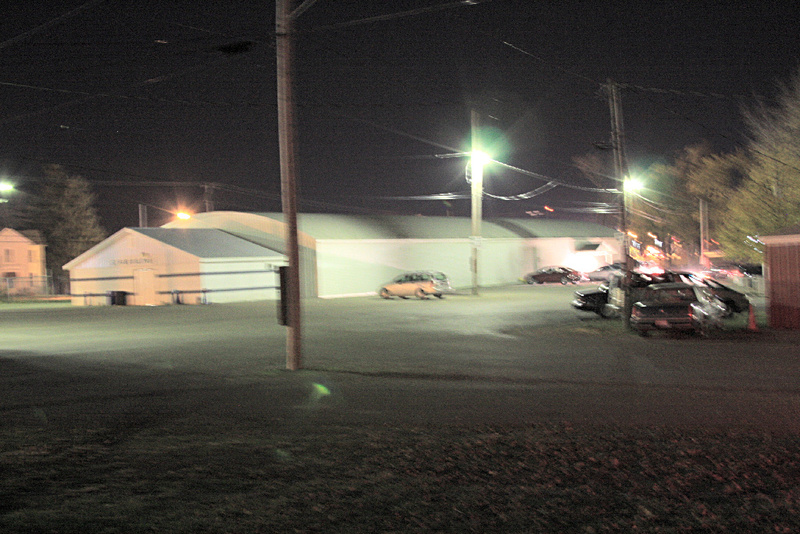 On the other hand, one of the other precincts apparently had a bus load of people all come in at once. 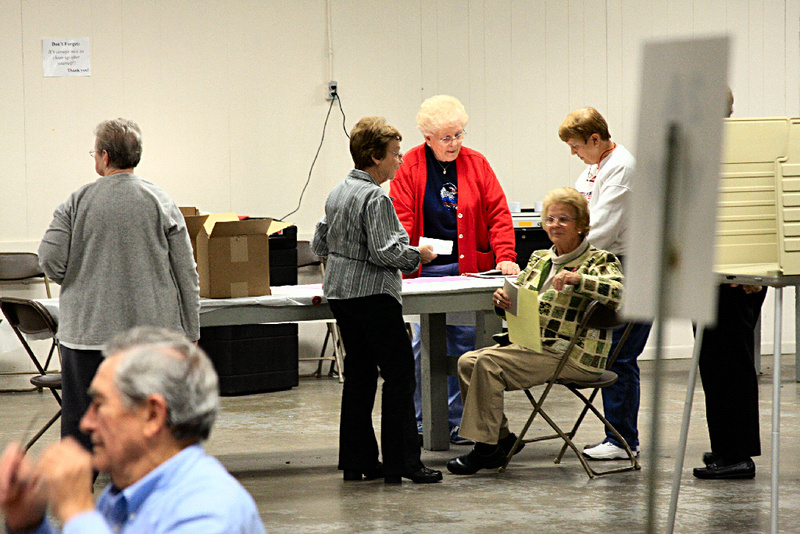 They had a line going out of the building waiting to get their ballot, then waiting to mark their ballots. And after they did that, they had to wait in line again to put their ballot into the scanning machines. I am sure some of them were less than happy about all the waiting, but I didn’t see any anger or hear anything about them being really upset. Things really slowed down for us during the last hour, with only a few people coming in to our precinct. 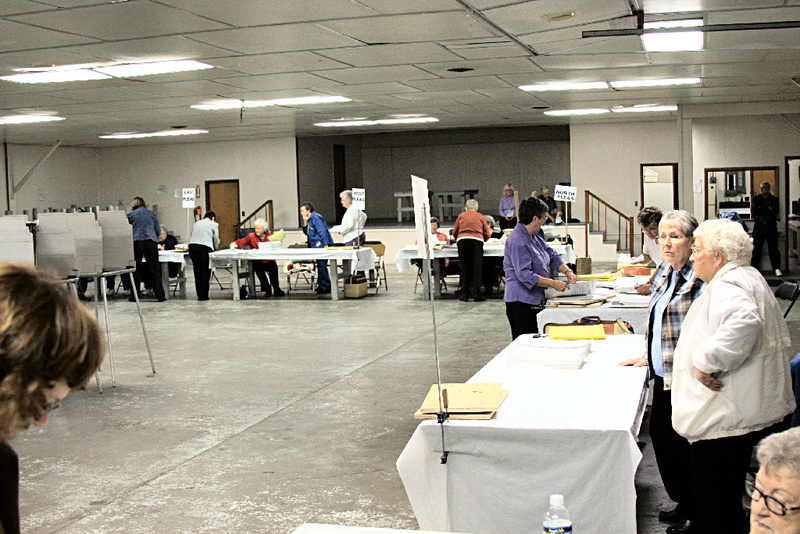 None of the precincts were really busy, there were only 3 or 4 people still voting when the 7:30 announcement that voting was over was given. Then came closing things down. A precinct captain making certain that she had the correct procedure. Besides making sure that all the numbers added in our books, we had to sort out and count all of the ballots. Since each of the machines had several precincts in it, that took quite a while. 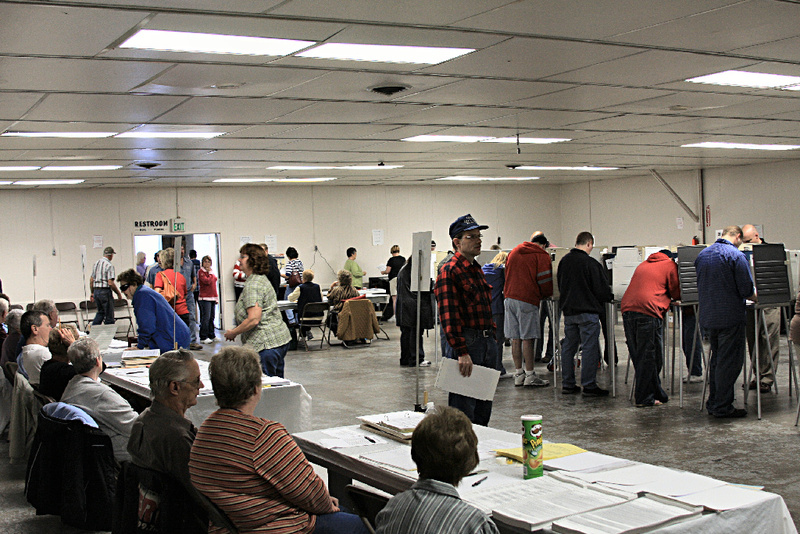 It didn’t help while you were counting when someone from another precinct would come over and give you a ballot that had been missed during the sorting. On one of those occasions, all 4 of us at our table had to start over after losing track of where we were. How long it took each precinct depended on how many voters they had and how well the numbers matched. When you finished and were 2 ballots off, you were happy if someone showed up and gave them to you, even if it did mess up your counting. 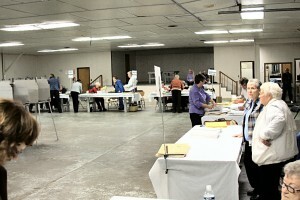 Different precincts in different stages of sorting and counting ballots. There were two women at our building acting as poll watchers. They wandered around all day, watching what was happening, occasionally asking questions and helping voters with questions they had. After the polls closed, I asked them who they were with and they told me the Democratic Party. I understand the desire of the Democratic Party to make sure that everyone got to vote and the votes were counted accurately after 2000 and 2004. But having observers at places like Van Wert is pretty much a waste of resources. The people that worked with me were happy to help anyone vote, and did their best to make sure that everyone that came in wanting to vote had the chance, no matter who they wanted to vote for. I only know of one man that didn’t get to vote, he couldn’t remember the last time he had voted and he had not made sure he was registered before the deadline. And our precinct captain spent almost a half an hour making certain there was not way he could cast a vote. I wouldn’t say I had a fun day. I enjoyed talking to the ladies I was working with, and I have always enjoyed doing things like this or serving on juries. I understand that makes me somewhat weird, but it is hardly the only thing. I may or may not do this again. It will depend on a lot of things, mostly how much free time I have. But I am glad I did it this time. Leaving the building after the fun is over, 9 PM.